La Ciudad Universitaria, or University City, is the name given to the mass expanse of space that encompasses the main campus of the National Autonomous University of Mexico (UNAM), the largest and most recognized public university in Latin America located in the southern section of Mexico City. I attended UNAM during the Fall semester of 2011 while still an undergrad, taking courses in the Faculty of Philosophy and Literature and Faculty of Political and Social Sciences and I can definitely confirm the hype – it is bureaucratically and spatially enormous. The campus, built on an ancient solidified lava bed, encloses a soccer stadium, about 40 faculties and institutes, the Cultural Center, an ecological reserve, the Central Library, and a few museums. At the heart of a total of 730 hectares of space lies the symbolic and political center of CU located in the northern section of the campus. Here lies Las Islas, an open esplanade of trees and reposing students, built in the likeliness of Mesoamerican architecture of Monte Alban. After a day of classes it is habitual for students to extend themselves all along the central quad and relax beneath its trees and along its stone benches. Sitting and chilling out in Las Islas, where couples and lovers find their intimacy and students their repose, I came into harmony with the historical and political greatness of the university. Here I sat surrounded with a 360-degree view of its oldest buildings, the great and impressive Central Library and the University Olympic Stadium. This layout symbolically represents the autonomous and political power of the university in Mexico and as explained by a fellow student and friend, here we can discern UNAM’s body politic. 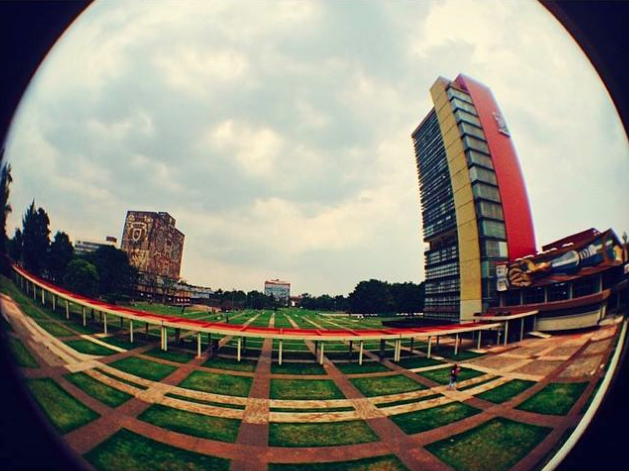 At the vanguard of UNAM is the graduate studies building to the north of Las Islas, occupying the role as mind, to the right is the Faculty of Architecture as constructor and creator, and to the left is the Faculty of Philosophy and Literature and the Central Library, the bastion of resistance and knowledge. And just south, towering over the vista of the Olympic Stadium and the far off mountains that curve around the Valley of Mexico is the heart of UNAM, represented in a majestic rectory tower adorned with the murals of David Alfaro Siqueiros. In this beloved and what seems like the most ancient part of the university, where the muralistic inspiration of John O’Gorman, Siquieros and Diego Rivera abound, students and urban trekkers alike can enjoy a hearty meal of tacos de canasta (the chilango delicacy of steamed tacos) along with the cultural and political luxuries of an autonomous university in Latin America. With musing theater students and the poetry of the shade during midday complementing the spatial and visual grandeur, the setting attests to UNAM as a splendid intellectual and spiritual oasis in Mexico City.